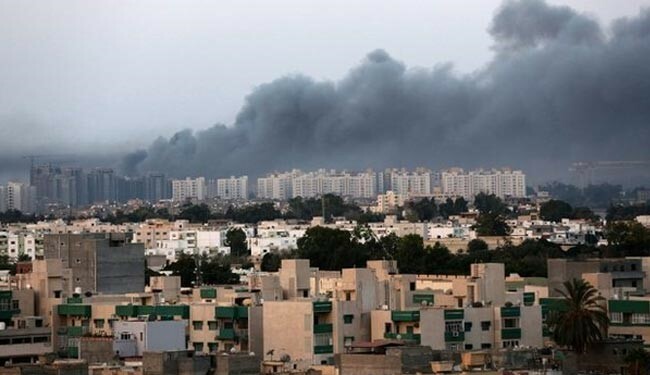 Smoke billows over Tripoli as fighting intensified earlier this week. The Pentagon and the United States Department of State has confirmed that it believes Egypt and the United Arab Emirates have been involved in airstrikes in Libya, causing ‘concern’ over foreign intervention. “We understand that there were airstrikes undertaken in recent days by the UAE and Egypt,” stated US Department of State spokesperson Jen Psaki during the Department’s daily briefing. In a press conference, the Pentagon also confirmed that the US believes Egypt and the UAE have been involved in the airstrikes. “We do believe there were airstrikes undertaken in recent days by the UAE and Egypt inside Libya,” said Press Secretary of the Pentagon, Rear Admiral John Kirby. The statement by the US State Department had come hours after a joint statement by the US, France, Germany, Italy and the UK warned against ‘outside interference’ while condemning the escalation of violence across Libyan cities. Despite the US’ belief of Egyptian involvement, Egypt’s Ministry of Foreign Affairs has rejected the claims. During the State Department’s daily briefing, spokesperson Jen Psaki was asked to differentiate between US involvement in Iraq and the believed Egyptian and Emirati involvement in Libya. “Iraq has invited the United States in to help address the threat from ISIL. We have undertaken a range of strikes, as you know, and we have a broad, comprehensive strategy,” said the spokesperson, citing it as one ‘significant’ difference. Upon being asked about why the US would intervene in Syria if it felt the Islamic State posed a threat, but at the same time express concern to UAE’s involvement in Libya if the UAE felt threatened, Jen Psaki stated that the Libyan crisis could not be solved militarily. “In terms of the justification for the UAE, our concern here is about the fragile state of Libya’s political process. We believe there isn’t a military solution. The political process is what the focus needs to be on, and hence the concern that we have,” stated Jen Psaki. Libyan officials have not confirmed Egypt and the UAE’s involvement in any military operations. Libyan government sources, in unconfirmed statements, said that the airstrikes originated from ‘elsewhere.’ Anti-Islamist forces in Libya have meanwhile claimed responsibility for the airstrikes.